You could happily spend years walking in this very beautiful and varied area. There is something for every walker: Munros, Corbetts and hundreds of smaller hills; family-friendly woodland walks; island routes; coastal treks and long distance trails. It’s a hilly area, with the exception of Islay, and has much of the grand loch-filled scenery one normally associates with more northerly regions. And it’s bursting with history; many ancient castles and attractions can be visited as part of a walking holiday. Head uphill and, at a sharp left bend, go though a metal gate to follow a path. This leads to Caol lla Distillery! Turn right over a stile to follow a lane to the left, rejoining the road. Go right for 4km to Ballygrant. Here turn left, signed Mulindry, taking the left lane at a fork. In 100m, turn left through a gate to follow a woodland track. At a T-junction, turn left to follow Loch Ballygrant. When the track leaves the loch, continue by woodland. The route then runs by Lily Loch. Curve around the head of the loch and head uphill, then left, through a gate. keeping to the track to reach a T-junction. Here, turn left, and go through a kissing gate, to the road. Turn right to return to Port Askaig. Distance: 7.5 miles. Time: 3.5 hours. Most of this route follows clear tracks through pine forest with sections across open country and some exceller sea views. From the car park walk along the track by the right edge of the forest. 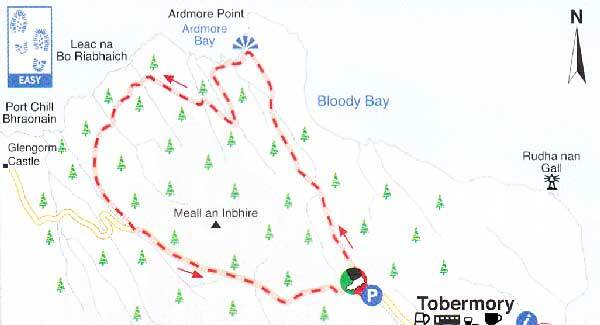 This is part of the Ardmore Glengorm mountain bike route. Descend into the forest, following red way-markers. Further on, the walk parts company with the cycle route and continues to Ardmore Bay. This is a particularly outstanding viewpoint and Ardmore Point can be seen to the right. The path continues beside the shore and later rejoins the cycle route. Further on, there is an open view across to the Isles of Coll and Tiree and the Ardnamurchan peninsula, the most westerly point on the British mainland. Towards the end of the walk, 19th century Glengorm Castle (which is now a Bed & Breakfast) can be seen to the right. Distance: 8 miles. Time: 4 hours. 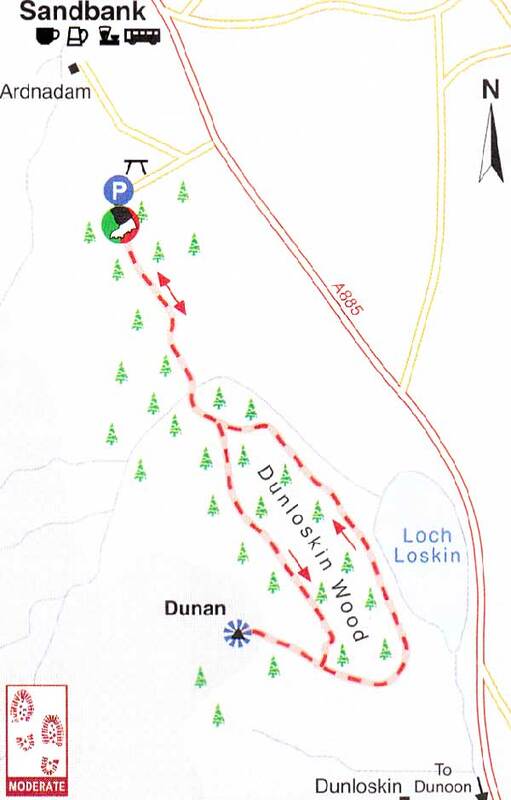 This is a short walk with a steep ascent to a viewpoint high over the town of Dunoon on the hill known as Dunan. There are stunning views over Dunoon, the Holy Loch, the Firth of Clyde and the surrounding hills. Follow the well surfaced path through the woods to the Ardnadam enclosure, where signs indicate the sites of prehistoric building believed to be 5,000 years old. Cross the burn on an unsurfaced path. Bear right at the next junction to climb the path through the woods and turn right to ascend Dunan. Enjoy the view and descend past the path junction to continue downhill, joining a track near Loch Loskin. Turn left on the track, then left into the woods, on a path which rejoins the outward route near the enclosure. Distance: 2.5 miles. Time: 1 to 2 hours. This walk starts and finishes with a section by the beautiful, rush-lined, Crinan Canal. The middle section climbs through the mixed woodland of Knapdale Forest at the northern end of the Kintytre peninsula. The canal opened in 1801 linking Ardrishaig on Loch Fyne with the Atlantic by Crinan, and presented an alternative to the often treacherous journey around the Mull of Kintyre. 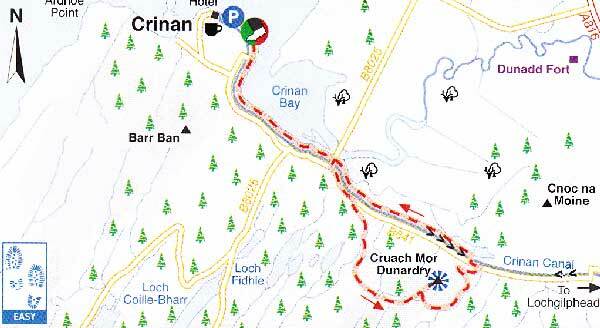 In the woods, a short detour to Cruach Mor — the viewpoint at the highest point of the walk — will pay dividends. From here there are extensive views across the Crinan Canal to the Paps of Jura. The prominent rock ahead is Dunadd, the site of an Iron Age fort and the capital of the Kingdom of Dalriada, founded by the early Scots who landed in Argyll from Ireland in the 6th century. Distance: 9 miles. Time: 4 hours. Creach Bheinn (810m) is a Corbett, which will give you a great appreciation of the magnificent Firth of Lorn. Its name comes from the Gaelic for bare, or windswept, hill – you have been warned! From the road, follow a track. 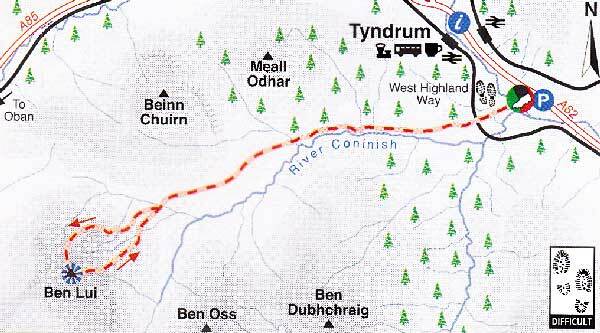 This soon changes to an intermittent track, which leads alongside the north side of the Allt Buidhe stream to climb up into Coire Buidhe. Keep walking east to reach the bealach (560m) between Creach Bheinn and the Munro Beinn Sgulaird. From here an obvious ridge leads south-west to Creag na Cathag. Continue south-west until the ridge steepens and head west to pass through rocky outcrops (easily bypassed) to the minor top (804m). Continue, south-west, over easier ground for 1km to reach the large cairn on the main summit. Enjoy the view before retracing your steps. Distance: 9 miles. Time: 4.5 hours. This challenging hill walk, on one of Scotland’s most spectacular mountains, is for experienced walkers. Walk west from the car park to the track, which leads for 8km up the long Cononish Glen (mountain bike recommended); a track from the train station leads, through woods, to the glen. The mountain is best climbed from the north-easterly side. From the foot of Coire Gaothaich ascend the steep ridge to Stob Garbh. Continue around the corrie edge, where the path steepens and narrows, eventually ending at a cairn a few metres from the north-west top of the mountain. Reach the summit from here via a short ridge traverse overlooking the steep corrie. Take care in poor visibility. Continue around Coire Gaothaich and down the south-east ridge to return to the Allt an Rund and back to Cononish Glen. Distance: 13 miles. Time: 7 hours. 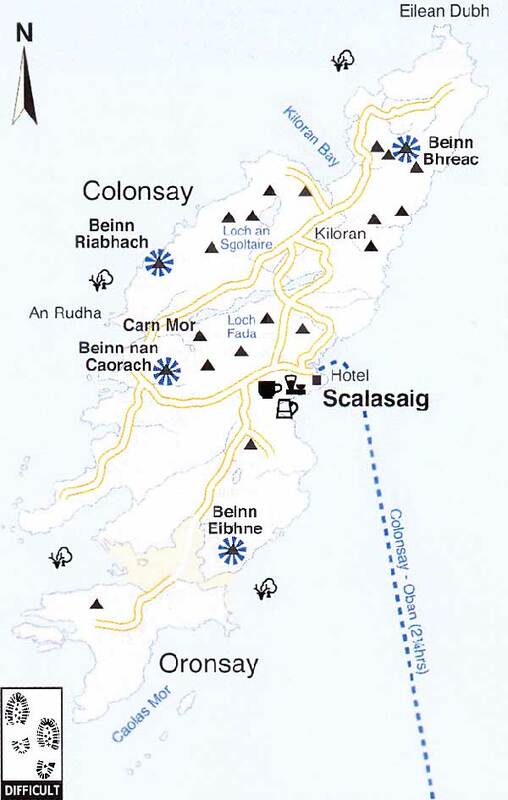 Try something different on the small islands of Colonsay and Oransay off the Argyll coast to the north of Islay and Jura. The MacPhies, defined as ‘an eminence in excess of 300ft (91.46 metres) high’, are Colonsay’s equivalent of the Munros. They may be much smaller than Munros but the tops provide magnificent vistas nearby Hebridean islands and the Argyll coastline. A popular way to walk these interesting hills is by accepting the MacPhie Challenge! 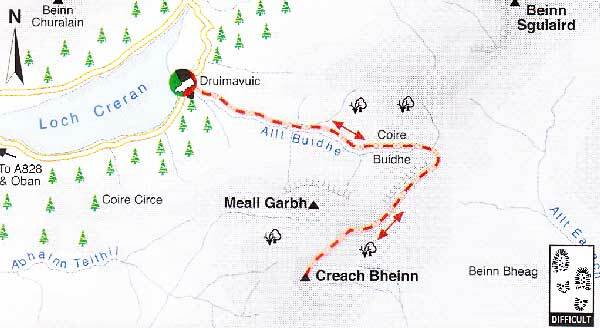 This involves a wall (OS map required) of approximately 32km in 24 hour climbing all 22 peaks (in any order) in one connected route with the journey starting and finishing with any point below the High Water mark. To complete the route, one must plan for the high and low tides in order to be able to walk over to Oransay. This is a lovely short but steep hill walk overlooking the pretty Highland village of Killin. From the top enjoy spectacular views over Loch Tay, Ben Lawers and the Ptarmigan (Meall nan Tarmachan) Ridge to the east and west to Strath Fillan. The walk is signed from the park and a path leads to reach three cairns — the summit of Sron a Chlachain is indicated by the biggest flat topped cairn. You can either return via the outward route, or carry on following the drystane dyke, heading west-north-west until you reach a path. This leads down, northeasterly, to a restored longhouse. This interesting National Trust for Scotland property provides a glimpse of Scottish village life in the 19th century. 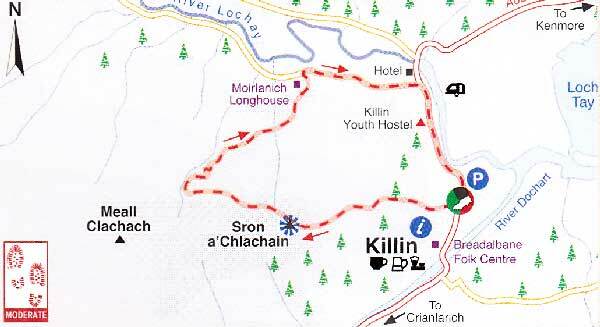 Follow the minor road east and turn right at the main road to return to Killin. Distance: 3 miles. Time: 2.5 hours. This walk provides fabulous views over south Loch Lomond with its numerous islands and follows a section of the West Highland Way, Scotland’s oldest and most popular long distance walking route. 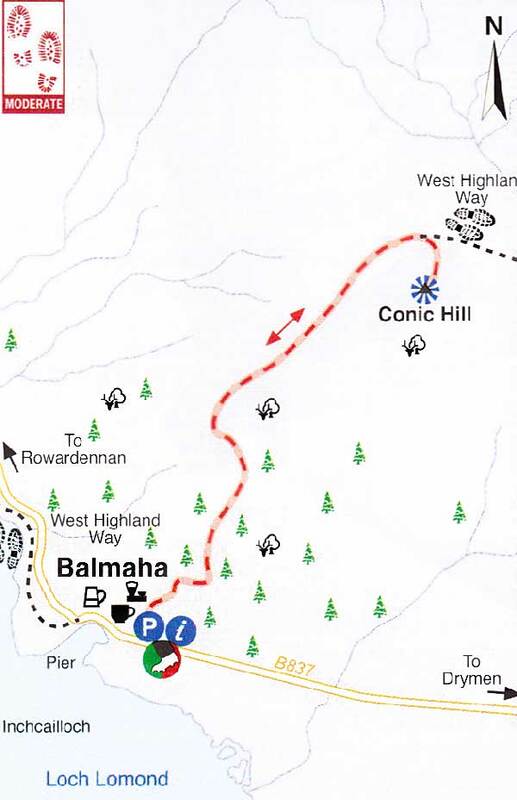 The route starts by the Visitor Centre in Balmaha to past through the Balmaha Plantation along a broad path After a short climb the path turns left and narrows as it heads towards open ground following the West Highland Way. Now on open ground the path threads through the Bealach (Gaelic for High Pass) Ard and steepens as it climbs towards the summit of Conic Hill at 361 metres. Conic Hill forms part of the Highland Boundary Fault— the geological divide which separates the Scottish Highlands from the Lowland and the fault line can easily be seen from the summet and across a line of islands below. Distance: 2 miles. Time: 2.5 hours. Stirling, in the east of the region, has played a pivotal role in Scottish history. Legendary battles include the Battle of Stirling Bridge in 1297 when William Wallace repelled the English and, of course, the Battle of Bannockburn in 1314. The national Wallace Monument stands proudly on Abbey Craig from where the patriot led his attack. A good, short, walk on the crag can be combined with a visit to the monument where you can see a replica of Wallace’s enormous sword and enjoy excellent views over the Forth Valley. From here it’s apparent how important Stirling would have been in historical times as the city, built on a volcanic plug, it has a commanding position over the lowest crossing point on the River Forth. A castle has stood here since 1100 and has been home to many Scottish kings and queens. The striking castle one sees today, which is open to visitors, dates from the end of the 15th century. A circuit can be made around the castle walls and through the old town where there are several other notable buildings. Locally available guidebooks detail the many town and country walking options. Further west Loch Lomond and The Trossachs National Park is just a short distance from the City of Stirling. Extending over 1,865 square kilometres, it is an outdoor lover’s Mecca with 20 Munros and 20 Corbetts to tackle. There are a wide range of outdoor activities available with providers in and around the National Park. The eastern edge of the park extends to Callander, north of which, lies beautiful Loch Lubnaig where there are loch side trails and canoeing opportunities. Experience it on a calm autumn morning and you’ll feel enriched. At the heart of the park lies the beautiful, pendant-shaped, Loch Lomond. From its southern basin by Balloch it tapers exquisitely to the wilder, mountainous, northern end. There is an abundance of easily accessible and satisfying walks and climbs. A great wee hill for views is Beinn Dubh (751m), which rises from the village of Luss on the west side of the loch. As you ascend its broad ridge you get a fabulous aerial perspective down over the loch and its wooded islands. Across the loch stands the Munro Ben Lomond and to the north-west are the Arrochar Alps, a wonderful jumble of craggy, character-filled, mountains. Lower level walks can be enjoyed on the east side of the loch where the combination of water and woodland is irresistible in autumn. The western side of the park extends into the Cowal Peninsula, which is an attractive and tranquil place. A good time to visit is when Cowalfest is underway (4-13 October; cowalfest.org) for a celebration of arts, walking, cycling and drama. A programme of multilevel guided walks forms a central part of the festival. At the end of a day’s tramping there are many cosy restaurants and pubs dotted about where hungry walkers should sample the local seafood. Loch Fyne, which bounds the peninsula on the west, is renowned for the quality of its oysters and other seafood. A visit to this region must also include a stay in the West Highlands and Islands. The principal islands of Islay, Jura and Mull have many fine coastal walks and are rich in wildlife. Mull has a Munro, Ben More, and established walks on various sections of the coastline. BBC Springwatch viewers will be aware that Mull is home to breeding populations of the largest UK bird of prey — the white-tailed sea eagle. Although a red-listed species, recent surveys show that this majestic bird is making a comeback on the west coast of Scotland. Other wildlife include golden eagle, otter, bottlenose dolphins, porpoises and occasionally minke whale. Further south, on the islands of Islay and Jura, you’ll see plenty of wildlife too. Most obvious on your approach are the seals, which live round the coast. Jura is also famous for its 5,500 strong herd of red deer. Enjoy the wild aspect of Jura where you can hike the ‘Paps’ or just wander to your heart’s content. Neighbouring Islay is a lush, more populated, island where you can enjoy life at a slower pace. Coastal walks abound and birdwatchers will enjoy seeing the tens of thousands of over-wintering geese. 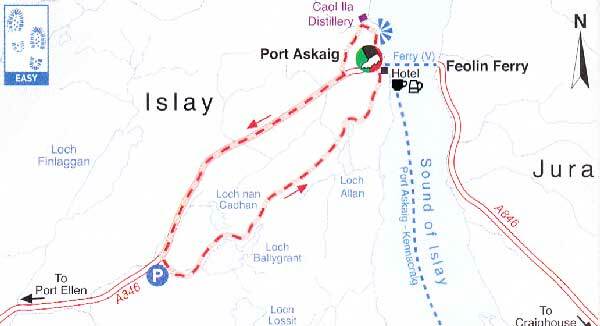 With eight single malt whisky distilleries on the island, whisky lovers will be in heaven, too, and a visit during the Walk Islay Walking Festival (12-20 April; walkislay.co.uk) is recommended. On the mainland there is an abundance of walking choices. Those with an interest in history should explore the prehistoric sites in Kilmartin while mountain lovers are spoilt for choice with some of the best hill walking in the country. 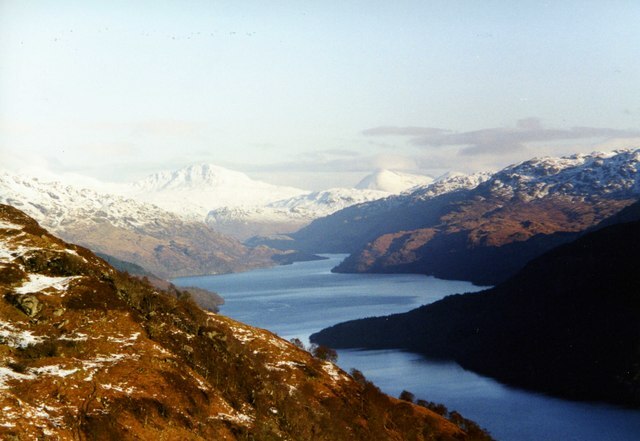 Try the Munro Ben Cruachan for views across the West Highlands to treasure.